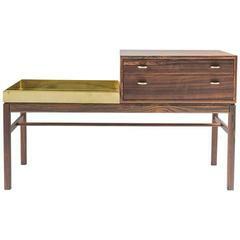 Midcentury Danish modern coffee table and planter. Made in Sweden by HMB Möbler. Just imported from Denmark! Refinished top with gorgeous teak wood grains. Removable steel tray. Some vintage wear on the legs. 39 1/4” long x 15 3/4” depth x 16 3/4” tall. Beautiful handmade glazed earthenware planter in tan, brown, orange and black with landscape decoration. In excellent condition with drainage hole. Measures: 9” x 9” x 6.5”. 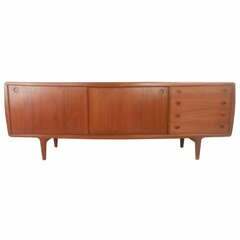 1960s Danish rosewood sideboard, Midcentury design. 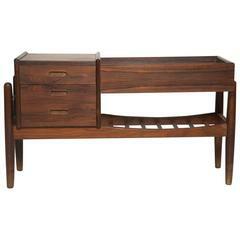 Petite low rosewood credenza made by Troeds Bjarnum of Sweden.